Goodness gracious how time flies. I honestly don’t know what happened to the months of March and April! If you see March or April, could you please ship them back to me? I’ll pay postage! We just sent out a May Newsletter and we anticipate that there will be another Newsletter emailed out soon. If you haven’t already, please consider Subscribing to our Newsletter 🙂 Our Newsletter is powered by MailChimp and is very secure. The signup process requires that you confirm your Newsletter Subscription via email. Sometimes this step is problematic. If you have trouble signing up for our Newsletter, we can add you manually. Simply email us at aidanstoytrove@gmail.com and request to be manually added to our Newsletter. It feels like we are still recovering from BreyerWest 2017. In truth, BreyerWest took place scarcely more than a month ago and we still have pictures and videos to post. Argh! We are very excited to be vending at the Western States Horse Expo in Sacramento, California which will be held June 9 – 11th 2017. You can purchase advanced discounted admission tickets. We will be located in Building D which is close to the main Freedom Arena and the Food Court. The Western States Horse Expo will be offering free bag checking so you can shop til you drop! We will have twice the booth space that we had at BreyerWest and boy do ever intend to fill it with everything model horse! If you will be attending the Western States Horse Expo, please be sure to stop by and see us! We will have a large selection of new and used Breyer Horses. Our Breyer stock will include the Traditionals and Classics from the Breyer 2017 Lineup, Corral Pals, Mini Whinnies, retired New In Box Breyers, BreyerFest Horses and other Special Run Breyers and loose retired Breyer Horses. We will have a few Breyer Custom horses for sale as well as Breyer tack and accessories. We will have a whole herd of new and retired Breyer Stablemates. We will also have a large selection of Copperfox Model Horses. We will have both first quality Copperfox horses and second quality Copperfox horses. For those that asked for Copperfox bodies, the second quality horses will be discounted and have excellent remake (and shelf) potential! We are still only allowed to sell Copperfox Horses face to face (not online.) However, if you know someone attending the Western States Horse Expo, pickups are permitted 🙂 We will be bringing our $5 barrel that will be filled to the brim with model horse goodies. We are setup to take credit cards and will of course accept cash. We are unable to accept personal checks. 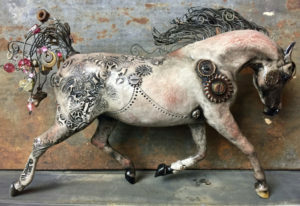 Elayne Watrus will also be attending the Western States Horse Expo with a large selection of her Custom Breyer Steampunk Horses. Elayne has been working steadily to create a variety of styles on a wide range of Breyer molds. There might even be some customized Peter Stones! Please be sure to stop by Elayne’s booth in the art gallery section. Her horses truly must be seen in person to be appreciated. There are some great model horse auctions ending this weekend. 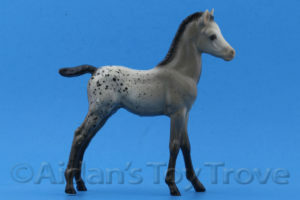 One auction is a very rare Breyer 39 Spot – Glossy Grey Appaloosa Proud Arabian Foal. A number of people asked about time payments on this fellow, we are happy to accept time payments but you must contact us first for prior approval. If you won’t be attending the Western States Horse Expo, here is your chance to snag a one of a kind custom Breyer by Elayne Watrus. Both of Elayne’s horses have bids and will sell. 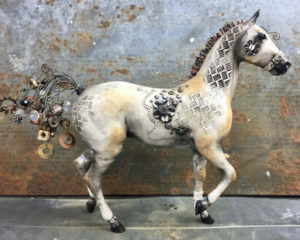 Breyer Custom Steampunk Lonesome Glory by Elayne Watrus. His auction ends at 6:30pm PST on Saturday, May 13th. Breyer Custom Steampunk Weathergirl by Elayne Watrus. Her auction ends at 6:30pm PST on Sunday, May 14th. Breyer Appaloosa Proud Arabian Foal his auction ends at 6:14pm PST on Sunday May 14th. We will also be posting new videos to Aidan’s Toy Trove YouTube Channel on Thursday, Friday, Saturday and Sunday. If you like what you see, please consider subscribing to our YouTube Channel 🙂 That’s it for now. Have a wonderful end of the week everyone!